"Crayon Shin-Chan" is a great anime series about all the troubles slice of life genre doesn't often exhibit. The anime series has a truly strong potential to generate an incredible spin-off with all the elements of the original anime/manga. It's well-known that Crayon Shin-Chan is a "seinen" genre anime when you realise all the things the series criticize using a kid as a main character, a kid who takes the adult's worst side and makes their words and behaviors look "innocent", but it isn't far from reality, kids are continuously learning thanks to their parents, their teachers... but they are not always the best example for the own children, so they are what they see from adult people. Now let's talk about "Shin-Men". As I have said, Crayon Shin Chan is an anime series which has a powerful seinen potential, due to its clever plot, but this particular spin-off lacks absolutely the main esence of the original series. "Shin-Men" works really well as a "shounen" anime, but not as a Crayon Shin Chan spin-off. The main themes from Crayon Shin-Chan are not present in Shin-Men, this one works in a different way and miss the Yoshito Usui's burlesque and acid way of expressing ideas. 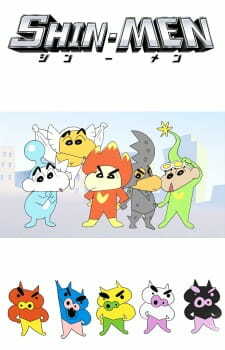 I think it was a wrong idea to create new Crayon Shin-Chan stuff without considering the original autor's work at all. I also missed the original roles of the main characters, and didn't like the art too much, I get some weird feeling from it. Only the red Shin-Men takes the original Shinnosuke Nohara's personality. The other characters are not bad, but they absolutely don't work well as Crayon Shin-Chan characters. The problem is that Shin-Men forgot the original anime and manga's roots, because Yoshito Usui (the original manga creator) was already dead back then. Crayon Shin-Chan needn't a spin-off like this one, because it doesn't seem like from the anime series. In conclusion, you may find interesting "Shin-Men" if you consider it as a shounen anime, but you shouldn't expect to see the original source material of the manga and the early anime, or at least to do a clever use of Crayon Shin-Chan's jokes more than just showing them. The best way to find a meaningful purpose in "Shin-Men" is estimating that the story, in some way, comes from a child's mind, the childish and most creative part of Shinnosuke Nohara.